Fort Worth Home Builder Plans on 420 Closings in 2018. 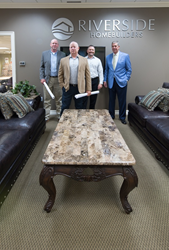 Riverside Homebuilders' leadership has worked together for more than 12 years. Riverside Homebuilders, one of the largest locally owned new-construction builders in the Dallas-Fort Worth area, is proud to announce a successful 2017, with 286 homes closed last year. That comes just six years after the company built its first home. After a banner year for the company, Riverside Homebuilders is looking forward to 420 closings in 2018. The Riverside team includes more than 100 years of combined experience in the homebuilding industry. That starts with Fleet, who oversaw the construction of more than 900 homes as the supervisor for his family’s construction business. In the early 1990s, Fleet stepped out on his own with Lackland Holdings, which has successfully completed more than 160 commercial projects. Fleet has been joined in Riverside Homebuilders by many who bring a wealth of homebuilding experience with them. In addition to a record number of homes built in 2017, Riverside Homebuilders was named a DFW Top 50 Builder. Since Riverside Homebuilders started building homes in Fort Worth in 2012, the company has expanded to build affordable, high-quality homes throughout North Texas, including Weatherford, Aledo, Brock, Boyd, Rhome, Springtown, Fort Worth, Saginaw, Godley, Decatur, Gainesville, Terrell, Bells, Leonard, Farmersville, Trenton, Van Alstyne and Nevada. Riverside Homebuilders specializes in building single-family homes on one-acre homesites ranging in price from $220,000 to $400,000. The company also builds affordable homes in the inner-city areas starting at $170,000. Riversides attributes much of its success to finding land and buildable lots overlooked by other builders. To learn more about Riverside Homebuilders, visit http://rshomebuilders.com/.